Thanks for signing up for the Black Spur Ultra. Sinister Sports (formerly Full Moon Adventure Company) has been hosting endurance events since 1999, and we are so excited by this spectacular venue that we have chosen. Kimberley is truly a special place; if you have not been there recently, you will soon see why. Black Spur Ultra combines some of the best trails in the area with viewpoints and scenery that only a few people ever get to enjoy. With several hard climbs across the 54km and 108km course, this race is going to put your endurance to the test. 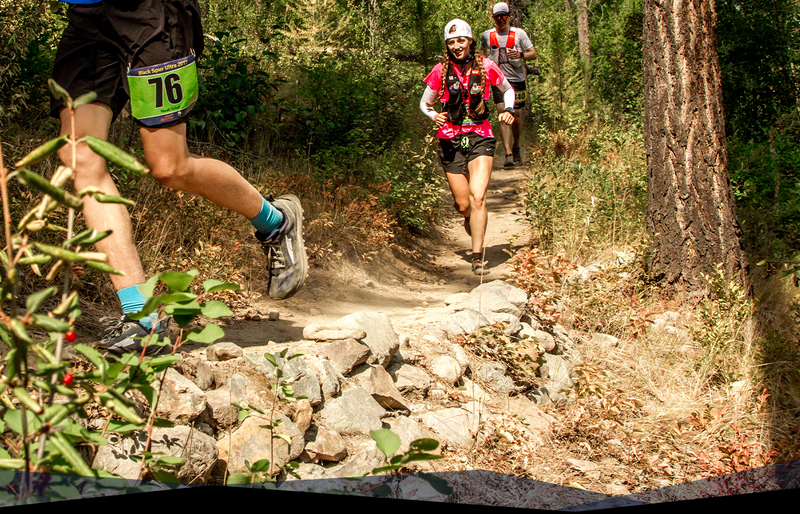 Both solo and relay runners alike will find this race challenging. We hope this package will cover all of the information you need to know and more. It was written with the über-planner in mind, so we hope it covers all of the details. We want to provide an amazing experience from start to finish. We’re racers too and know it can be frustrating if something seems to be missing or vague. Contact us at any time and we will be happy to answer your questions or clarify race details for you. Thank you again for signing up and we look forward to seeing you before the race. The closest airport to Kimberley is the Canadian Rockies International Airport, which is located 20 minutes south between Kimberley and Cranbrook on Hwy 95A. The airport offers daily flights to regional destinations on Pacific Coastal and Air Canada. For ground transportation, you can rent a vehicle, take a taxi, or pick up a shuttle to Kimberley. Please use this map for basic driving directions to Kimberley or go to our website: http://www.blackspurultra.com/travel.php. Race package pick-up and sign in will be held at Kimberley Alpine Resort Conference Centure from 15:00hrs to 21:00hrs on Friday. Solos will also check in drop-bags, if necessary, at this time. If you are unable to attend on Friday night, we will accept registrations up until 7:15hrs on Saturday. The Cafeteria is downstairs on the east side of the plaza, just north of the main office. The post-race breakfast and awards will be held in the conference centre to the southwest of the plaza. Up to you! Kootenay House is 2.4km one way. 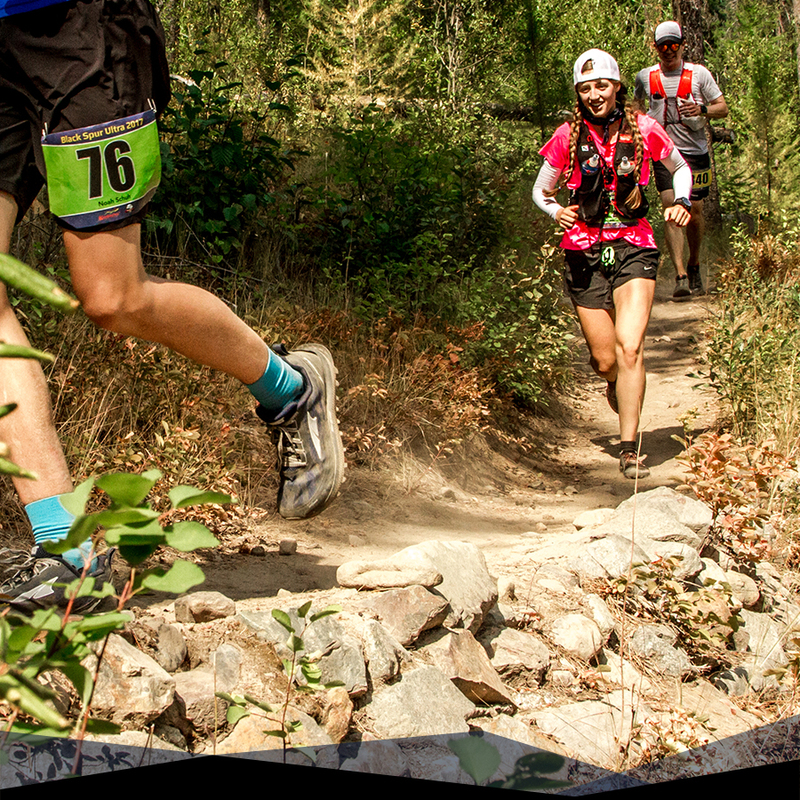 Celebrate the Black Spur with your fellow runners. Competitors receive tickets to the post-race meal and awards as part of their registration. Extra meals will be available for purchase online prior to the race. Everyone is welcome, whether or not you finish the race, so please do stay and share your experiences. We will also honour racers for achievements such as “first blood”, the Marty Lund Spirit Award, and more. Stick around – who knows what awards you may qualify for. Be prepared for the Black Spur Ultra. You are the best person to help get yourself through the course and out of any trouble you encounter. During the race, you will be in some very isolated areas and may not have immediate access to facilities, or assistance of any sort. If you are running solo and cannot complete the 108km in the less than 13 hours, you will be running in the dark. The Black Spur Ultra is as mentally demanding as it is physically gruelling. We cannot stress enough that you will need to be self-sufficient when you are out there and the help you receive on course is very limited. Please note that any course descriptions in this document are subject to change due to environmental factors, weather, and wildlife activity. We will do our best to update you if changes arise prior to the race but we will confirm all of the details at the pre-race meeting. You will be running in remote wilderness, and the chance of injury is very real so prepare to be self-sufficient. We hire top-notch medical staff but they cannot be everywhere at once. If you are injured out on the course, be ready to hunker down for a few hours until a course sweeper or medic comes by. If you are injured but able to move, try and make it to the nearest Staging Area or Checkpoint. If not, try and send word with another racer or use a cell phone. Race marshals will be on foot and mountain bikes, sweeping the course one to two hours after all runners have started the leg. Please take the time to read the Emergency Protocol document on our website. There are definitely bears and cougars in the area. If there is reported activity around the course prior to, or during the race, we may modify the course. We cannot predict random animal activity so please stay alert. Take note of the information pamphlets, which will be available at registration, on what to do if you come across a bear or cougar on the trail. If you drop out of the race, it is essential that you contact the race HQ. If you do not, we will assume you are lost or injured and we will be out looking for you. If we mobilize a search party, you will be charged for any search and rescue fees that are incurred as this takes up valuable resources. Please just take a few minutes to check in. Even if you do drop out, we want you to join us at the awards lunch so you can share your stories and join in the camaraderie. If you have a medical condition or take medications that may affect your race in any way, you should consult your doctor before competing. We will have medical staff on site to help with first aid, search and rescue, and emergency transport only. They will not assess if you are capable to run. If you do have a condition that our medics need to know about, please fill out the Medical Form on our website. This is confidential and only used by our medics in case of emergency. 54k runners have 12 hours to complete the course. 108k runners have 24 hours. After that, you will not be able to continue the race. Each leg also has a cut-off time defined in the Race Rules; you must keep up with these times or you will not be able to finish in the allotted 12 or 24 hours. In addition, you must also start each leg by a specified time or you will not be allowed to continue. Please see the Race Rules for details. The start and finish area is located west of the central plaza at Kimberley Alpine Resort. Parking is located at the south end of the resort. Between each stage of the race is a Transition Area (TA) located next to the start/finish area. At the TA you will be able to access supplies, meet your support crew or relay runner and take a break in relative comfort. The TA will also have some basic facilities such as washrooms, snacks, water, and shelters. When you finish a leg, you will pass through a chute which will allow you to check in, get your time, and continue on to the next leg. This is also where relay runners will tag off. These chutes are extremely visible and will have large signs stating the end of the leg and where to go for the start of the next leg. Race crew and volunteers will be waiting at the chutes to assist you if required. The TA is used multiple times so it is critical that you follow instructions in order to avoid confusion. We know you will be tired and probably delirious, but please be aware of the signs. All solos are allowed to have a drop bag at the TA. If you are running the relay, you are still allowed to have drop bags, but please try to have any necessary gear with your teammates. We will provide labels for your bags at racer registration. Racers should take their drop bags to the start area on Saturday morning before the race. Bags will be placed in a line at the TA so make your gear noticeable. Use a weatherproof bag or bin, as we may not be able to shelter this gear. If you feel you can get by without support or drop bags, this is perfectly acceptable. You will need to meet the previous runner on your team at the TA. There is a designated chute for racers to enter and leave a TA. Please do not linger at the entrance or exits to the chutes – this holds up everyone else and creates a traffic jam. Try to be at the TA, ready to meet your runner, 30 minutes before they are expected. We are not able to give ongoing updates as to where runners are on the course so it is up to you to be ready. If you are not at the TA when your runner comes in, you do not get any time credit. There are also cut-off times listed in the Race Rules. If a team cannot keep up with these times, they will be given a forced start or disqualified. In the event of a forced start, relay racers are more than welcome to run but without an official time. If this is the case you still must start by the specified time. The course is further divided by several Checkpoints (CPs) staffed by race marshals. These locations are typically remote and act as safety points. All CPs are equipped with a radio and some have emergency supplies. You can expect at least one checkpoint per leg and the distances between them will vary. The Black Spur Ultra course will be well marked with flagging, signs and reflectors. There are a lot of trails out there, so you must pay attention to which leg you are running. Leg numbers are posted on all of our signs to help remove any guesswork. We cannot flag every 100m of the course but we will put markers in critical areas. All trail junctions will have a number of markers to show the right direction. If you don’t see a flag or sign for a while, you may want to retrace your steps to the last junction. Since the course is all counter-clockwise, you will be making mostly right turns at junctions… but watch the signs. We will talk about course markings at the racer meeting. Remember: It is still up to you to stay alert and watch for markers. We will do our best to make them frequent and visible, but the rest is up to you. We highly recommend reviewing the route on our website and making a visit to the area to run the course ahead of time. We will have a variety of snacks available at the TA and some hot food later in the race. We cannot accommodate every need so please plan to bring anything you really want via support crews, drop bags, or your relay teammates. All CPs will also have water and snack food. Water stations are marked on the course map. We strongly recommend that you be prepared to drink from streams or rivulets if you need water when higher up in the mountains. The water in the area is generally clean, and besides, illnesses like Beaver Fever take about two weeks to manifest symptoms so you should be fine for the duration of the race! Also note that all food and supplies are for racers and volunteers only. Relay runners are welcome to eat at aid stations on their leg, but spectators and support crews need to bring their own food; we do not want to run short. 54km racers have 12 hours to complete the race. 108km racers, including teams, have 24 hours to complete the race. Racers must adhere to the minimum mandatory gear requirements; all solo athletes and relay runners must be carrying the minimum mandatory gear requirements through all legs of the race. Any violation of the minimum mandatory gear requirements may result in disqualification. Headphones are not allowed on the race course. All racers should consider carrying the following gear. If we experience inclement or hot weather during the race, we may make adjustments to lighten your load, but have it handy. You may elect to carry additional gear, like bear spray, at your discretion. While the list above is for mandatory gear, please consider bringing extra kit that will help you in case of foul weather or crushing heat. These items can be stored in your support vehicle for easy access. Also see the Support Crew Information on page 13 for other TA ideas. Headphones: These are officially banned. You are in the wilderness and need to be aware of your surroundings. We have had several instances at previous races where our race marshals were unable to communicate with runners because of headphones. If you really require music, consider a small, clip on, external speaker for your media player. This may even help keep away the bears! Performance-Enhancing Drugs: We will not be doing drug testing but any racer found using, or supplying performance-enhancing drugs to other racers, will be disqualified and permanently barred from the Black Spur. Please see http://list.wada-ama.org/ for a list of banned substances. If you have concerns, please contact us. For the full elevation profile or to download the GPS coordinates for each leg, please visit our website at http://www.blackspurultra.com/course.php. Support people (aka Support Crews) are typically only required for solo runners as most relay runners do one leg and hand off to a teammate at the TA. A good support person can truly be the lifeline for a solo racer. Nothing beats coming into a TA where there is food, fresh gear, and encouraging words waiting. Support people help keep their racer moving. If you intend to support a racer, do not be afraid to ask questions – we want your experience to be as rewarding for you as it is for the competitors. Support crews may set up a site next to the TA. We ask that you keep your site minimal. If your racer doesn’t look well (delirious, dehydrated, or somehow broken), please contact our staff. The racer will not be disqualified for receiving medical aid.